Let’s talk about SET baby! 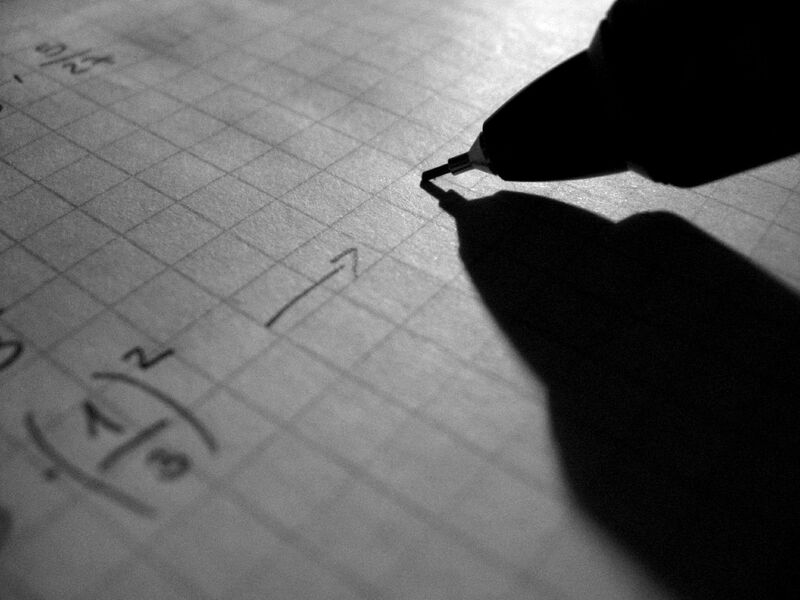 - MathedUp! Let’s talk about SET baby! 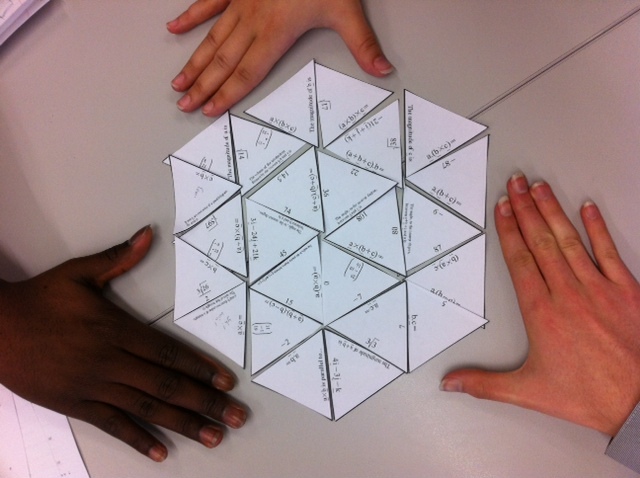 Last week Peterborough had its first Maths Jam. Amongst all of the maths puzzles being thrown about, a few of us settled down to exercise our minds by playing a nice game of SET cubed. 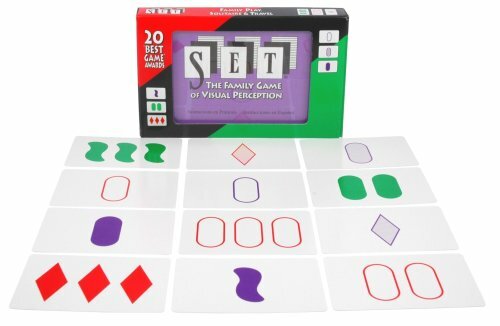 Those of you who are new to SET, it’s a game of connections. There are many variations to the game, but the main objective in all of them is to be able to complete a set of 3 cards. A set is a set when.. They all have the same number, or they have three different numbers. They all have the same symbol, or they have three different symbols. They all have the same shading, or they have three different shadings. They all have the same colour, or they have three different colours. For example,in the following the first three cards are a set as they all have a different number of items on each card, they all have a different symbol, they all have a different colour and they all have a different type of shading. The second group of 3 cards are also a set as they all have the same number of items, they all have a different symbol, they all have the same colour and they all have a different type of shading. Finally the last group of cards don’t form a set as we can’t say “they all have” about every property. A good place to get started would be to visit the website setgame.com. Anyway, having renewed my excitement about SET (I went through a phase a few years ago where I had downloaded the game on my iPhone and played it for hours!) I wondered how I could introduce it to my students. I wanted to do it in a way where I didn’t have to “teach” them anything so I put together a powerpoint and found a set of cards that I printed off. The first slide uses just one colour and just one shape. 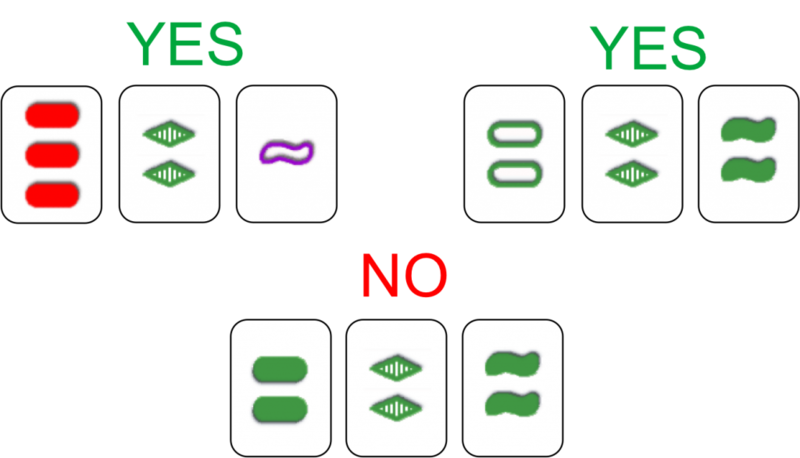 I shuffled the 9 cards and asked a student to pick out 2 cards at random. I then held these up and the students had to write down the grid reference of the card that would complete the set on their miniboards. I gave them absolutely no instruction about what would make a set, they just used their own intuition. This led on to some beautiful whole class discussion and we then slowly built ourselves up to the full set of cards. All of the students were able to complete any set I threw at them and I had given no instructions to them at all. It really was a fun lesson activity and we used the SET website to do a puzzle of the day to finish off our short session on this. I promised them a revisit later in the year and I may buy a few sets of cards to use in class. 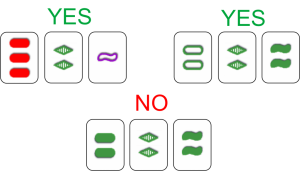 Some interesting tasks might be to ask..
How many cards do I need to have to guarantee that a set exists? How could you convince someone? 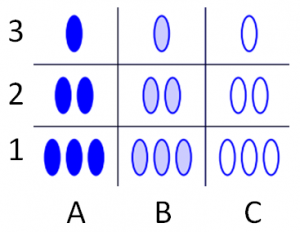 What do you think a set magic square might mean? Can you create one? If you enjoy set and these types of games, try the excellent website highergames.com but be warned, it is highly addictive! This entry was posted in Enrichment, Games, Key stage 3. Bookmark the permalink.